A contemplation of the horizon marks South Tyrolean artist Brigitte March Niedermair’s current solo exhibition at the Museo d’Arte Moderna di Bologna (MAMbo). This study connects two different photographic investigations: “Are You Still There,” 2011–14, and “Transition_Giorgio Morandi,” 2012–13. The latter series was made possible by a program the Museo Morandi has developed in recent years that encourages contemporary artists to measure their art against the great master’s. Working with the collection, which is housed at MAMbo, Niedermair considered Morandi’s historic studio on the Via Fondazza in Bologna. He spent nearly his entire life there, and Niedermair attempts to capture this through her attention to his perspectival and existential condition. 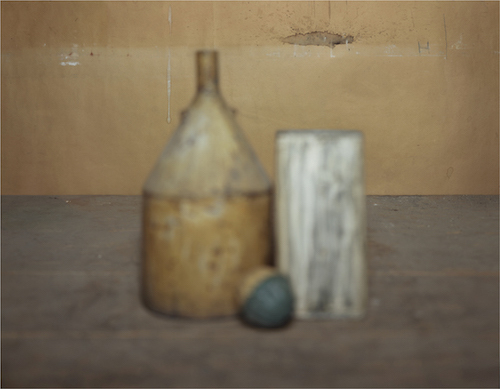 Many of her shots are populated with objects that Morandi depicted in his paintings, which are still present in the studio. In these pictures, Niedermair focuses on the horizon instead of the objects, and this elegant stance imbues her work with extraordinary pictorial value. While the individual photos in “Transition_Giorgio Morandi” do not have titles, those in “Are You Still There” reveal their provenance in both their titles and in the works. For example, the photo The Shining Pyramid, Pharaoh Sneferu Red Pyramid-Dahshur, which shows exactly that, is an exemplary work in this show. Like the other photos from this series, it seems to convey the origins of the very concept of the horizon, or rather the origin of human awareness of that concept.